IVRY : When American gymnast Kim Zmeskal didn’t do as well as expected at the Olympics, some people spoke of "child abuse". Others suggested the she had wasted her adolescence. What’s your view ? CARRIER : (Kim) did a counterperformance. For young athletes worn down by the Olympics atmosphere, counterperformances are linked to anxiety. Everyone says star athletes shouldn’t be worked so hard, so young. But young sports stars have always existed in every culture. What is important is to respect the hypermaturity of children who have sports careers. These children aren’t really children anymore. They must deal with money and the media more than those of their age groups. When they retire at age 18 they have an entire career behind them which may not be recognized by people they meet in later life... If you get a medal, it’s great. 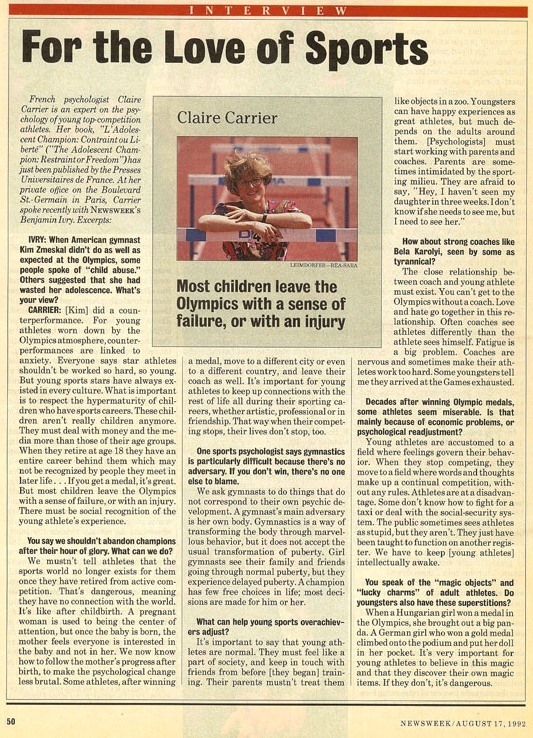 But most children leave the Olympics with a sense of failure, or with an injury. There must be social recognition of the young athlete’s experience. You say we shouldn’t abandon champions after their hour of glory. What can we do ? We mustn’t tell athletes that the sports world no longer exists for them once they have retired from active competition. That’s dangerous, meaning they have retired from active competition. That’s dangerous, meaning they have no connection with the world. It’s like after childbirth. A pregnant woman is used to being the center of attention, but once the baby is born, the mother feels everyone is interested in the baby and not in her. We now know how to follow the mother’s progress after birth, to make the psychological change less brutal. Some athletes, after winning a medal, move to a different city or even to a different country, and leave ther coach as well. It’s important for young athletes to keep up connections with the rest of life all during their sporting careers, whether artistic, professional or in friendship. That way when their competing stops, their lives don’t stop, too. One sports psychologist says gymnastics is particularly difficult because there’s no adversary. If you don’t win, there’s no one else to blame. We ask gymnasts to do things that do not correspond to their own psychic development. A gymnast’s main adversary is her own body. Gymnastics is a way of transforming the body through marvellous behavior, but it does not accept the usual transformation of puberty. Girl gymnasts see their family and friends going through normal puberty, but they experience delayed puberty. A champion has few choices in life ; most decisions are made for him or her. What can help young sports overachievers adjust ? It’s important to say that young athletes are normal. They must feel like a part of society, and keep in touch with friends from before (they began) training. Their parents mustn’t treat them like objects in a zoo. Youngsters can have happy experiences as great athletes, but much depends on the adults around them. (Psychologists) must start working with parents and coaches. Parents are sometimes intimidated by the sporting milieu. They are afraid to say, "Hey, I haven’t seen my daughter in three weeks. I don’t know if she needs to see me, but I need to see her". How about strong coaches like Bela Karolyi, seen by some as tyrannical ? The close relationship between coach and young athlete must exist. You can’t get to the Olympics without a coach. Love and hate go together in this relationship. Often coaches see athletes differently than the athlete sees himself. Fatigue is a big problem. Coaches are nervous and sometimes make their athletes work too hard. Some youngsters tell me they arrived at the Games exhausted. Decades after winning Olympics medals, some athletes seem miserable. Is that mainly because of economic problems, or psychological readjustment ? Young athletes are accustomed to a field where feelings govern their behavior. When they stop competing, they move to a field where words and thoughts make up a continual competition, without any rules. Athletes are at a disadvantage. Some don’t know how to fight for a taxi or deal with the social-security system. The public sometimes sees athletes as stupid, but they aren’t. They just have been taught to function on another register. We have to keep (young athletes) intellectually awake. You speak of the ’magic objects’ and "lucky charms" of adult athletes. Do youngsters also have these superstitions ? When a Hungarian girl won a medal in the Olympics, she brought out a big panda. A German girl who won a gold medal climbed onto the podium and put her doll in her pocket. It’s very important for young athletes to believe in this magic and that they discover their own magic items. If they don’t, it’s dangerous.